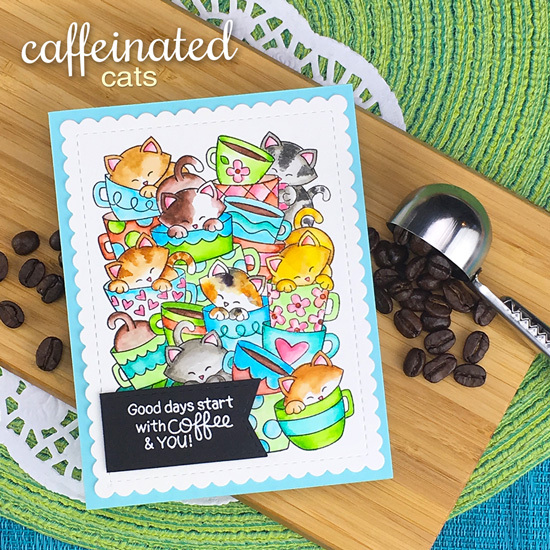 Today is reveal day two for our January Release and we have an awesome large stamp featuring two of our favorite things, coffee & cats, called Caffeinated Cats! We also have a giveaway today so make sure you read all the way to the bottom of this post to see how to win! Get caffeinated with adorable projects and more by our Design Team! The pink and lime color combo on this card by Tatiana is so lovely! She also created a fun two part sentiment by trimming the words apart after she embossed them! So fun! She added the scallop edged border too using our Frames & Flags Die Set. Maria created this amazing card! She colored the kitties from the new Caffeinated Cats Stamp Set in fun bright colors, then she fussy cut the image at and angle so she could add in a sunny stenciled background behind them. For the background she used our Sunscape Stencil! Perfect for sending sunny smiles! 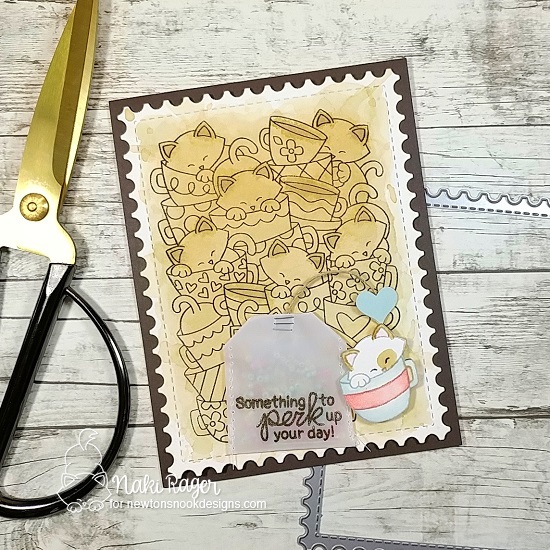 Larissa created a fun and simple card using this big set. She simply stamped the image in black and white and then framed with with a heart cut out of colorful pink and red paper! 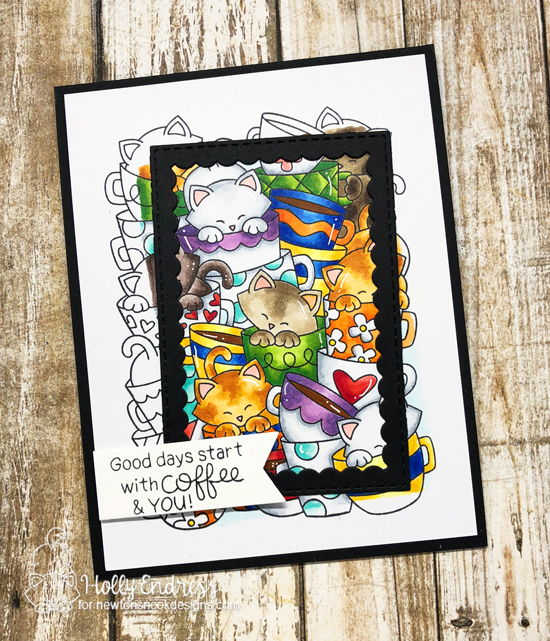 She also added the little "coffee date" sentiment along the edge using the words from our new It's A Plan Stamp Set (revealed here yesterday). She framed the whole thing with a scallop edged panel that was cut out using our Frames & Flags Die Set. 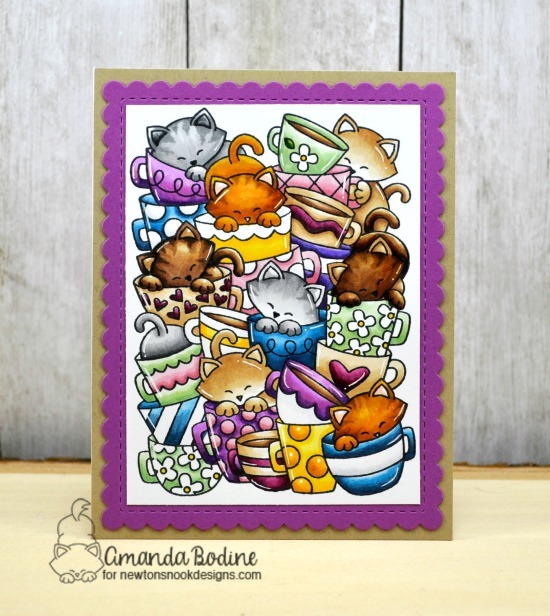 This card by Andrea is so fun and colorful! She colored all those kitties and mugs from the new Caffeinated Cats Stamp Set using copic markers. Then she cut the image out and added it to her card. She used our Frames & Flags Die Set to add the scalloped edge and also for the black banner. For her card, Naki used the big image from the Caffeinated Cats Stamp Set and created a TEA theme instead of coffee. She even colored the image USING TEA! How cool is that!? She added the sentiment onto vellum shaped like a tea tag and added a single colored kitty in the front! She also used the postage edge frame from our Framework Die Set. 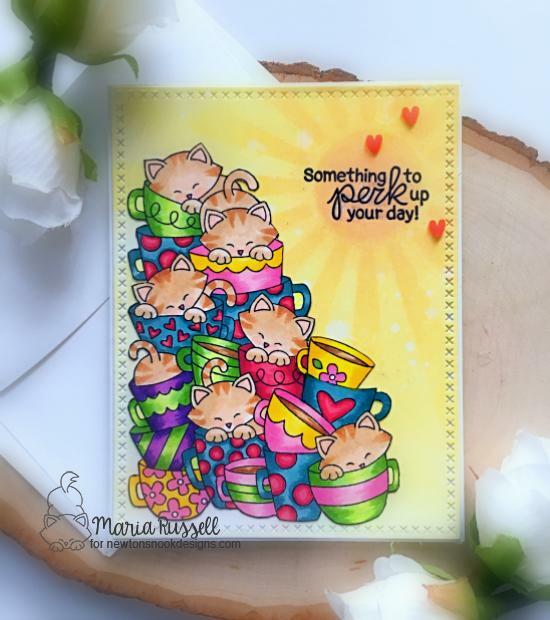 The colors of the cups on this card by Zsofia are so bright and cheerful! She even added stripes to some of the kitties! She framed the image using the scallop edged frame from our Frames & Flags Die Set and she also used the same die for the black banner that holds the sentiment. 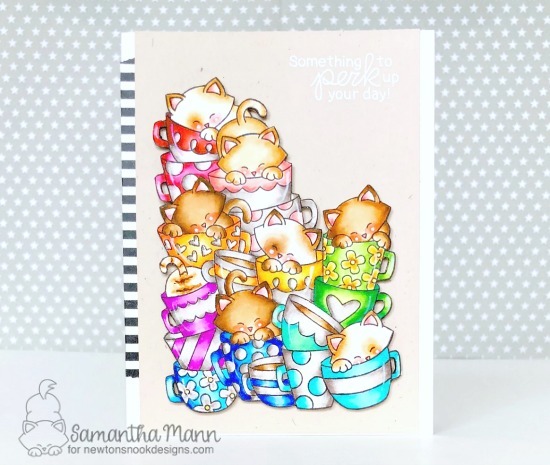 The rainbow of mugs on this card by Samantha will definitely brighten your day! She colored those kitties with distress ink and fussy cut them out to leave room for her sentiment behind them! It's so cute how she added little details with a white gel pen too. 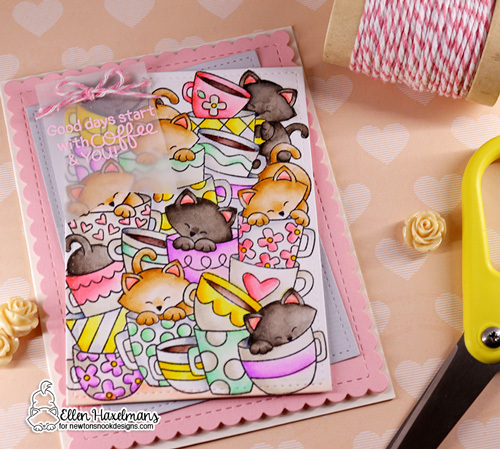 Ellen created this adorable card using the big image from the new Caffeinated Cats Stamp Set. 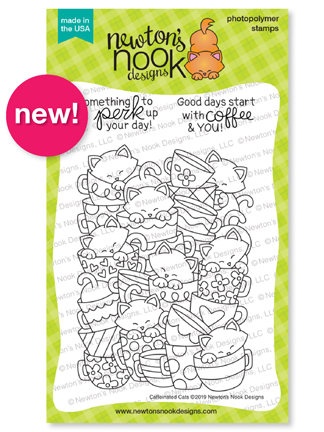 She colored the kitties in sweet candy colors that are perfect for a valentine or spring card. She added the sentiment embossed in pink on vellum. She also used our Frames & Flags Die Set for the pink scalloped panel behind them. The rich colors on this card by Amanda remind me of a coffee shop! 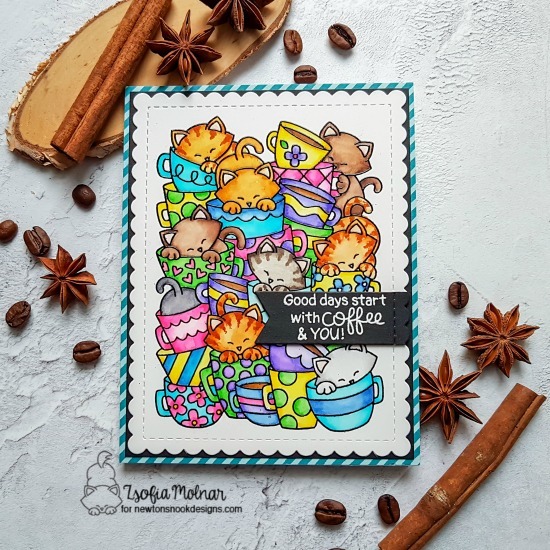 She colored the image from our new Caffeinated Cats Stamp Set with copic markers and added lovely gel pen details. Then she framed the whole thing with the scalloped edge using our Frames & Flags Die Set. 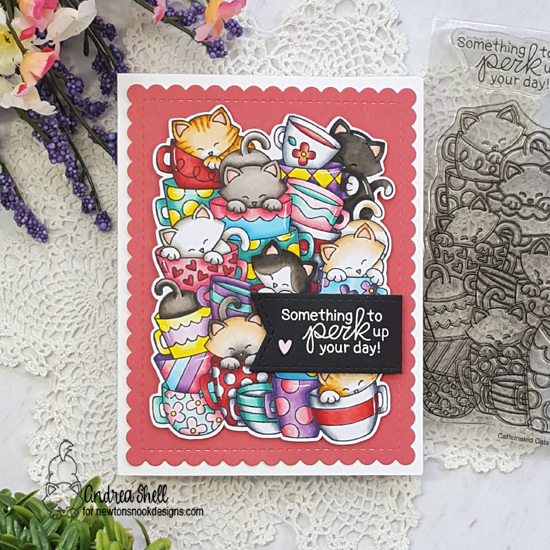 This adorable kitty card was created by Holly! It's so cute how she colored kitties from the new Caffeinated Cats Stamp Set inside the edges of a black frame! She used our Framework Die Set to cut out that fun frame and our Frames & Flags Die Set for the banner that holds the sentiment! So adorable! Would you like to win the “Caffeinated Cats” Stamp Set? Wow! I never, ever imagined how many totally different looks of the cards could be had using this wonderful, so-very-cute stamp. There is so much inspiration I've gotten, thanks. You had me at caffeine!! lol So very cute. So fun seeing different variations of style and color palettes! Oh, I LOVE this set - being the coffee lover I am! Fabulous projects by the DT and the different ways they used this darling set! Amazing! LOVE this stamp! Love coffee, love cats!!! LOVE NEWTON! Be still my coffee loving heart!!! What a great stamp!!!!!! Love this stamp set so very much! Must have it right meow! This is adorable! Cute creations by the team - love them! This is AWESOME! I love the mugs and kitties! Too cute! So many fun ways to color! Oh my word, I'm in love with this stamp! I'm all about anything coffee. How cute and fun with cats and coffee! Ha those caffeinated cats are wonderful! Love the full large stamp. These stacked image stamps are such fun! I am loving this stamp so much!!! and all the creations are fabulous!! These cats are super cute, but not all of us like coffee. A tea sentiment would have been perfect for us too. I love the new variation of a pile of Newtons! Very cute, especially for those of us who can't function without caffeine! Coffee and cats. What could be better? Love these cards. OMGoodness, this is the cutest! How do you keep coming up with these adorable designs?! Love your card, Jen! I just finished visiting your designers and I'm loving this stamp even more now! Exactly what KT Fit Kitty said, how do you keep doing it!? Creation after creation, wow! still have a fantastic card. Love this BG stamp!! SO cute!! Kitties and coffee, what could be better?!! I can see putting a pop up inside with the now caffeinated kitties bouncing around. LOL!! Adorable stamp for coffee & kitty lovers! So very cute! This is going to be a popular set! SOOO many cat lovers & coffee lovers out there! Even as a dog lover, I gotta love the pile of cats in their teacups! Gorgeous cards! I am really loving these new products! These are the cutest cat-feinated kitties ever! This is another must have set! Fabulous cards from the NND team! LOVE the Caffeinated cats set! So fun to see all the different coloring variations! Awesome cards! and the cards are so fun! Purr-fect set for any Cat Lover. Love it! Cats and coffee....what could be more PURR-FECT. Love this new stamp!!! Absolutely gorgeous stamp set!! I love all of the kitties in the coffee cups. Excellent idea for a stamp!! Such a cute set, because well cofffee and cats! Love all the inspiration from the DT!!! So totally cute.. love all the DT projects.. I just want to get out my Copics and color this NOW! Such cute kitties! Two of my favorite things! Tea cups and cats! I think this is going to be one of my favorite stamp sets. I love the kitties and tea cups. So lovin’ these kittens in the cups!! Awesome release on fantastic stamps!! KIttens and coffee - what could be any more cute! ?